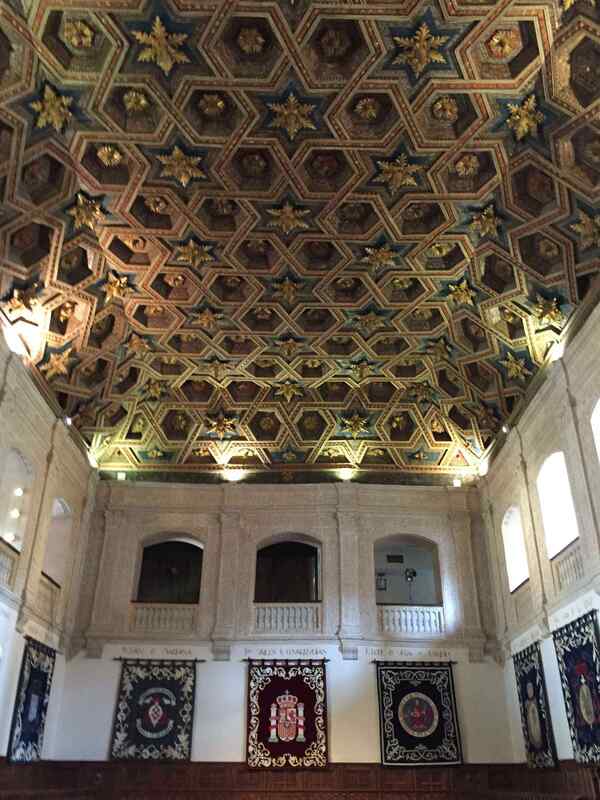 Universidad de Alcalá was specifically built to be a university when construction began back in the 16th Century. The wellspring of knowledge is a source point where humanity seeks answers and inspiration. Science, art, and human endeavor advance when passionate seekers draw forth the water of knowledge. One man, Miguel de Cervantes Saavedra slaked his thirst in 1605 and again in 1615, and in the process, he produced one of history’s greatest works of literature, commonly known as The Ingenious Nobleman Sir Quixote of La Mancha (or as it is known in Spanish, El Ingenioso Hidalgo Don Quijote de la Mancha). At the top of the facade are some of southern Spain’s regular visitors. White storks winter south of the Sahara Desert in Africa and regularly migrate to their summer nests throughout Europe and the Middle East. Beyond credit for creating one of world literature’s monumental works, Cervantes is lauded for inventing the modern novel, he is Spain’s greatest writer, and he set a standard for writing and storytelling that endures to this day. Quite an achievement, considering Cervantes did not come from wealth, nobility, or academia. 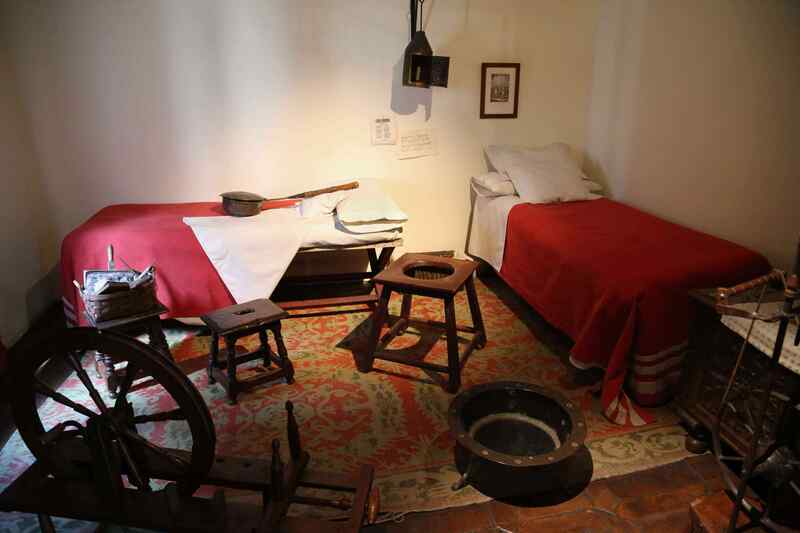 In fact, Cervantes was born in a small town northeast of Madrid, Alcala de Henares, and his working career was marked by periods as a tax collector, incarceration as a debtor and also a prisoner of war. It is thought the germ of his idea for Don Quixote (as it is universally known), came to him while he was in prison during part of his military service. 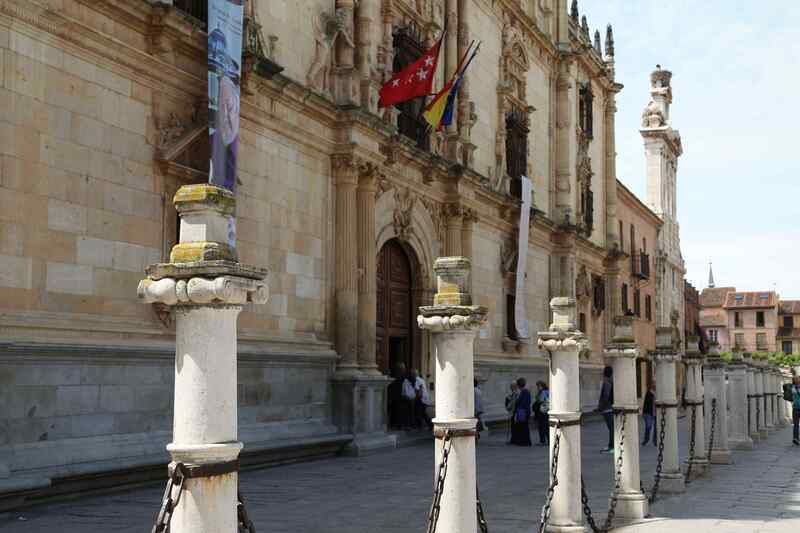 Alcalá de Henares has long been a popular place and the university is part of a UNESCO World Heritage site. 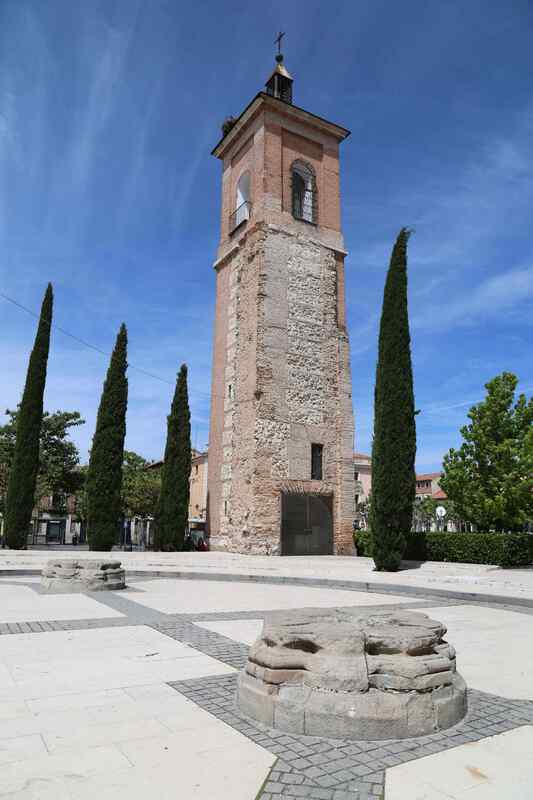 Owing to its favorable climate and locale, Alcala de Henares has been occupied since the Neolithic Age, as far back as 10,000 B.C. The Roman Empire located a settlement there, along the Henares River, and Alcala was the first city to be purpose-built as the home of a university that was founded in 1293. And like many places on the Iberian Peninsula, Alcala de Henares has been occupied and ruled by many cultures, including Visigoths, Moors, and finally Spaniards. 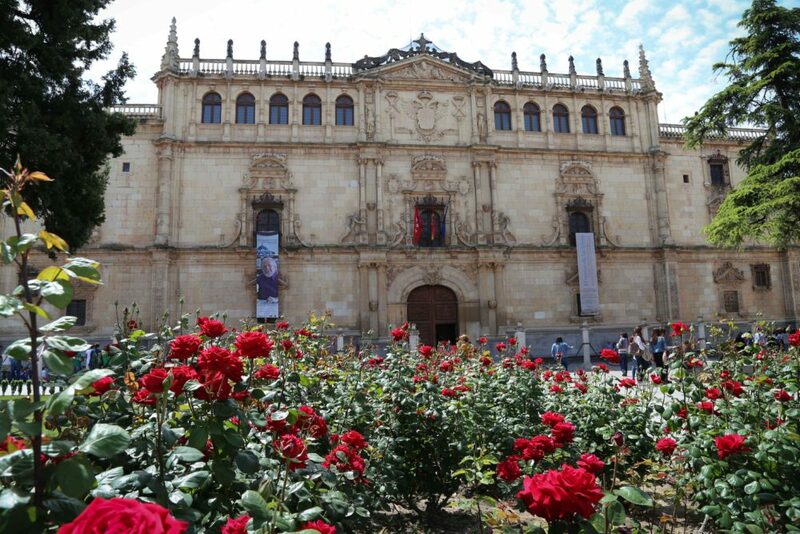 By the 16th Century, as many as 12,000 students were enrolled at the university Universidad de Alcalá, making it an important seat of learning and culture. In 1998 UNESCO named the university and historic center as a World Heritage Site. 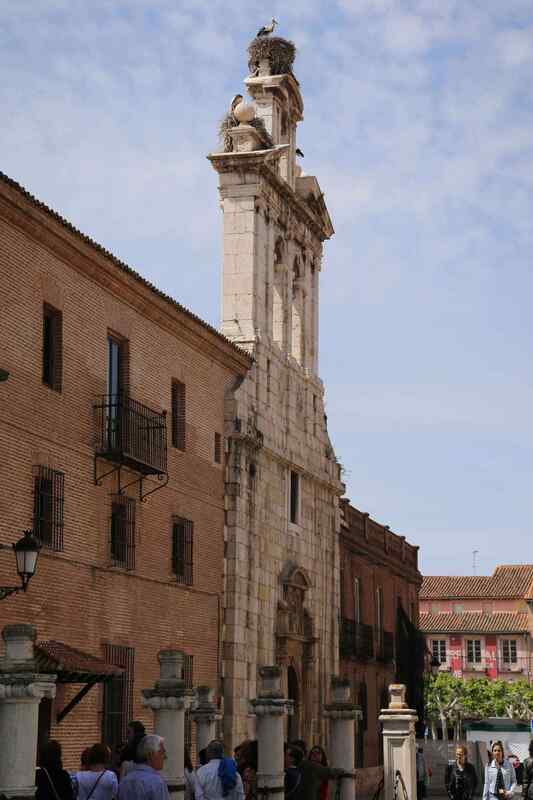 A watchtower makes a great perch for this white stork that calls Alcalá a summer home. 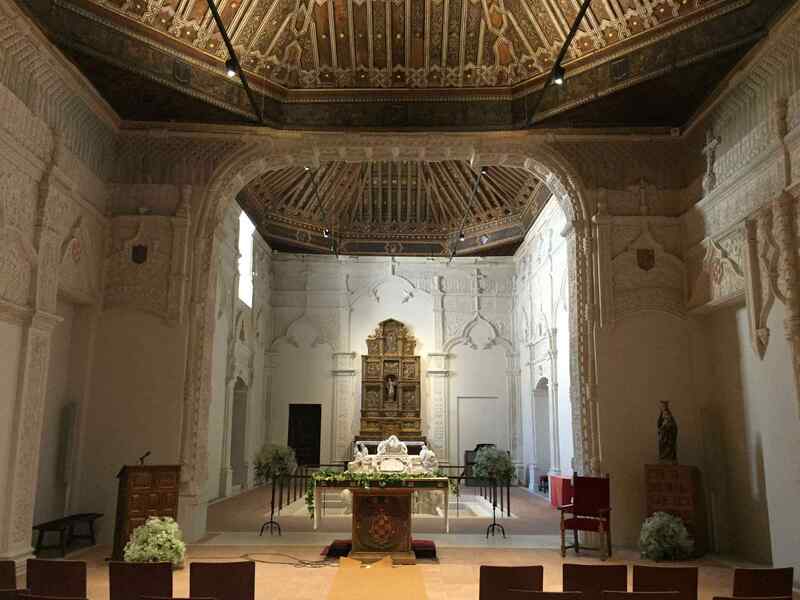 The Capilla de San Ildefonso was built in 1499 and reflects both Christian and Moorish influences. This ceiling was a painstaking effort that is a marvel of craftsmanship. Francisco Jiménez de Cisneros rose to become a formidable power in Spanish Catholicism. This imposing crypt is a centerpiece of the chapel. 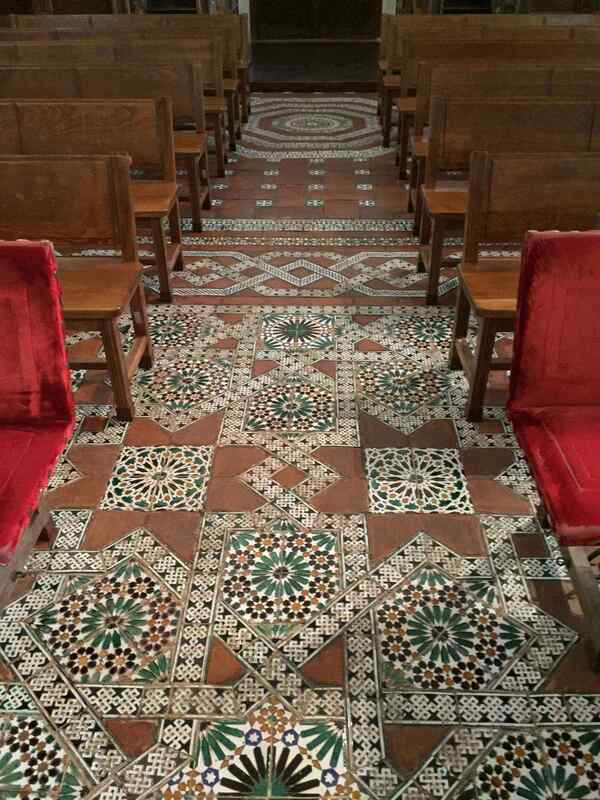 Moorish influence can be seen in intricate tile work on the floor of the church. For Cervantes, life did not begin on a high note, nor was he launched into the upper ranks of society. His father, Rodrigo, was a barber-surgeon who earned a meager living cutting hair and performing amputations of people’s limbs. (Surgery was looked down upon by physicians, and since barbers already had sharp blades to cut hair, they would be called upon to perform amputations.) Cervantes’ mother was the daughter of a nobleman who had lost his fortune, relegating their family to a life of toil and poverty. Cervantes, born in September of 1547 was the fourth of the couple’s seven children. 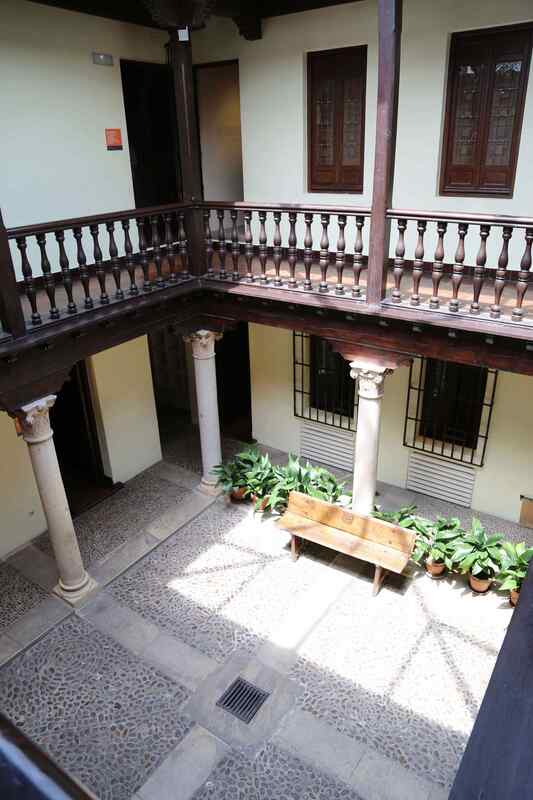 This courtyard is part of the home where Cervantes is believed to have spent his formative years. While in his twenties, Cervantes left Spain and traveled to Italy. The reasons for his departure are unclear and scholars have suggested he might have been a fugitive or that he had injured a man in a duel. But, historians note he was enlisted in a regiment of the Spanish naval marines by 1570. He fought in the Battle of Lepanto, the last naval engagement where the fight was carried out entirely by ships that were rowed (as opposed to sails or self-propulsion). During the battle Cervantes was wounded three times, twice in the chest and also the left arm, which he would lose the use of. After recovering from his wounds, he remained in the military and in September 1575 he was captured by Ottoman pirates and thrown into prison in Algiers. During the five years of his capture he attempted to escape four times. He was eventually released after his parents paid a ransom and Cervantes settled in Madrid to be near his family. 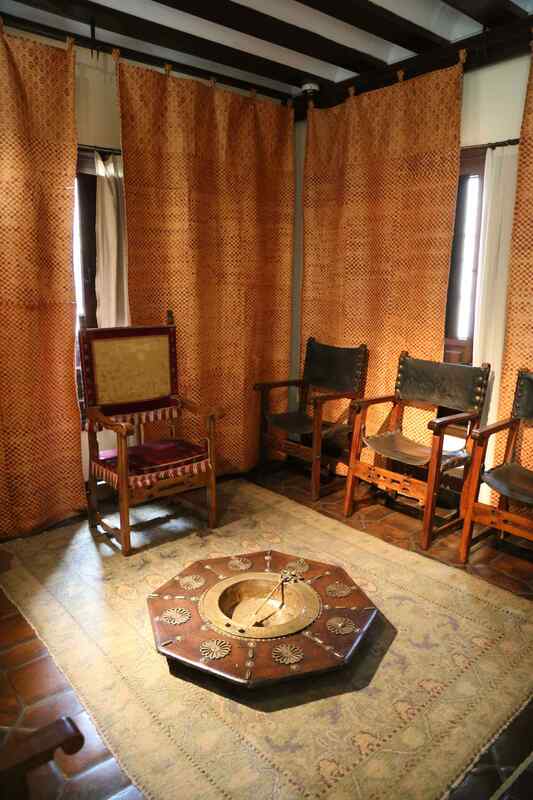 Moorish influence can also be seen in some of the elements of this sitting room of the home where Miguel Cervantes grew up. Like many of history’s struggling writers, Cervantes could not make a living solely on his creative efforts. He knocked around in a series of jobs, including accountant, tax collector, and purchasing agent for the Spanish navy. He declared bankruptcy and endured two more stints in prison (1597 and 1602) due to irregularities with the accounts he was responsible for. 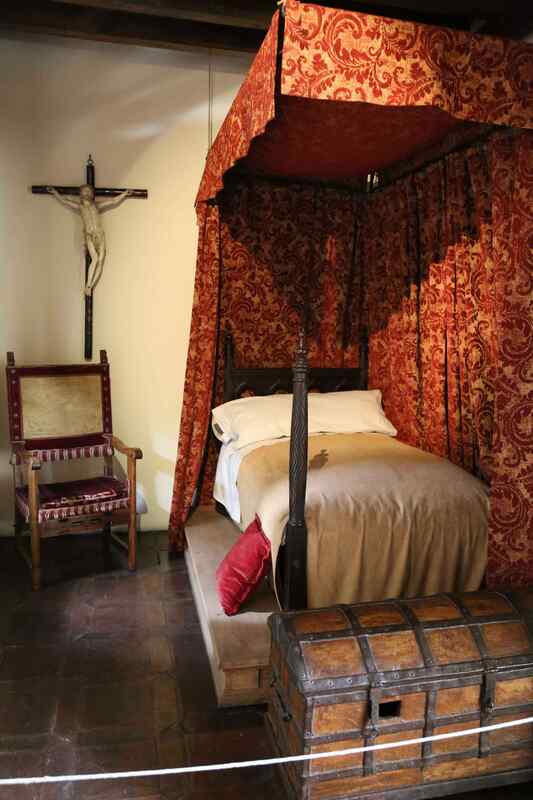 Five centuries ago, people were shorter, as evidenced by the beds in this sleeping area. 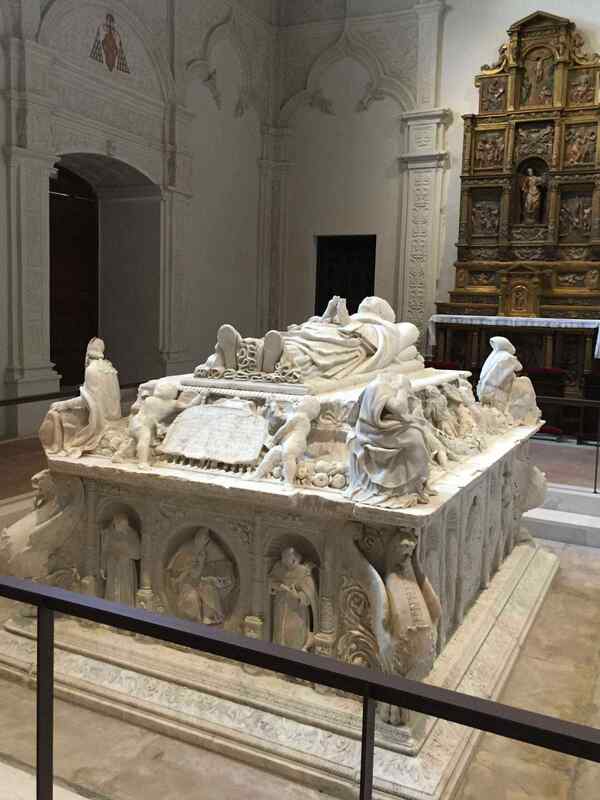 In the time of Cervantes, God was ever-present to the people of Alcalá de Henares, Spain. Curtains could be drawn for privacy in this bedroom. And while it is obvious now, Cervantes’ life at the time did not appear as though it were set upon the road of literature. But his experiences in the military, in prison, struggling in jobs, and persevering against a difficult life provided the spark for his now-famous character Don Quixote (who is thought to have been inspired by his wife’s uncle, Alonso de Quesada y Salazar). 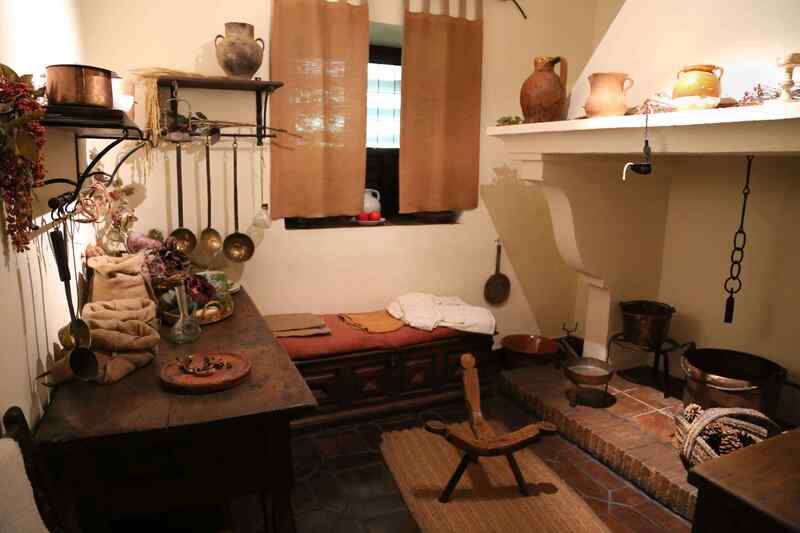 The kitchen, like this one in the Cervantes home, was a focal point then as it would be today. Warmth, food, and the aroma of cooking food has always drawn people together. 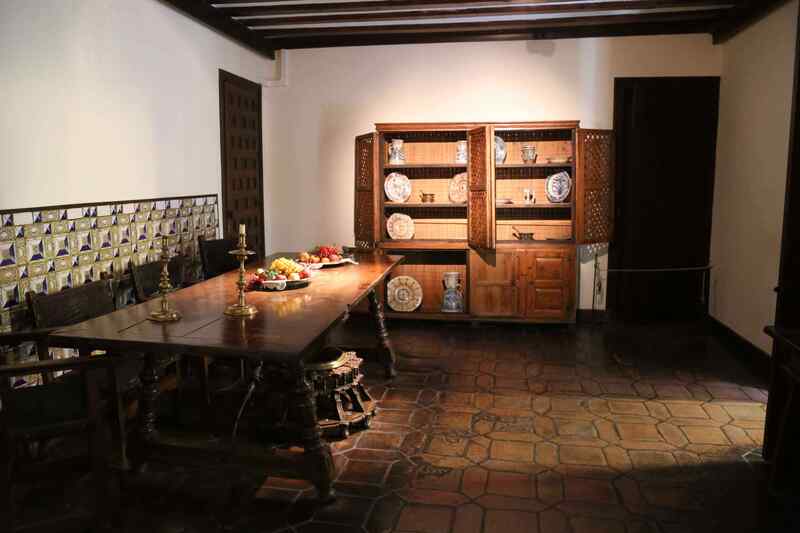 There were likely many discussion around the Cervantes table about how a financially struggling family would make ends meet. Their middle child, Miguel Cervantes would go on to become one of the world’s most famous authors. On the surface, Don Quixote is a straightforward tale of Alonso Quixano, who has gone mad but is determined to protect the idea of chivalry. He sets upon a quest hoping he can demonstrate that an honorable man is obligated to stand against injustice and protect the weak. As a literary device Cervantes creates the character Sancho Panza, a poor farmer persuaded to accompany Quixote and act as his squire. Sancho has as a keen rhetorical wit and through the expression of his doubts, enables Quixote to expound on the honor and worthiness of his pursuits. Cervantes’ work had such an impact that today’s vocabulary uses references from the novel, including “quixotic” to denote something extremely idealistic, impractical, and unrealistic. “Tilting at windmills” (at one point in the story Quixote hallucinated windmills as giants to be defeated through joust), is a popular phrase to describe taking on tasks that cannot be won. 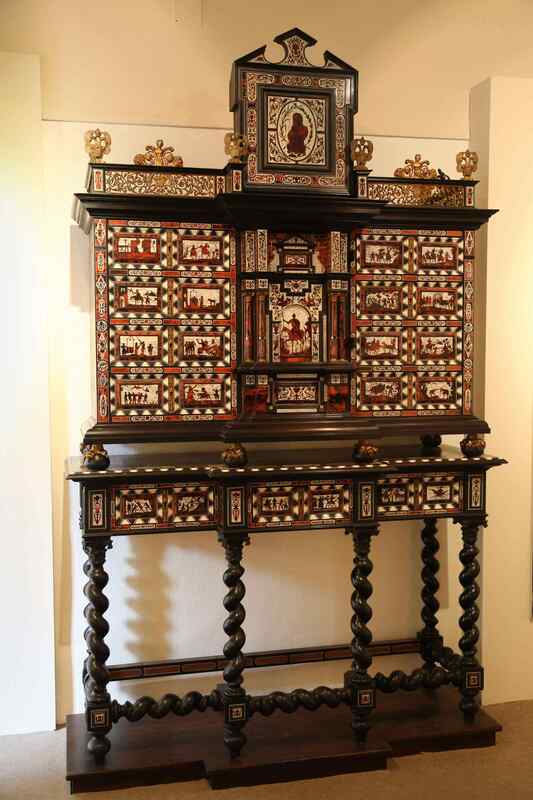 This barley twist-leg inlay chest is an homage to Cervantes, and upon closer examination, scenes from Don Quixote can be seen in the panels. The novel is actually two books. The first part was published in 1605 and mentioned a forthcoming volume. That prompted a charlatan to pen a follow up edition and claim to be Cervantes. But the great writer came out with the second book in 1615 and cemented his reputation as Spain’s greatest writer. 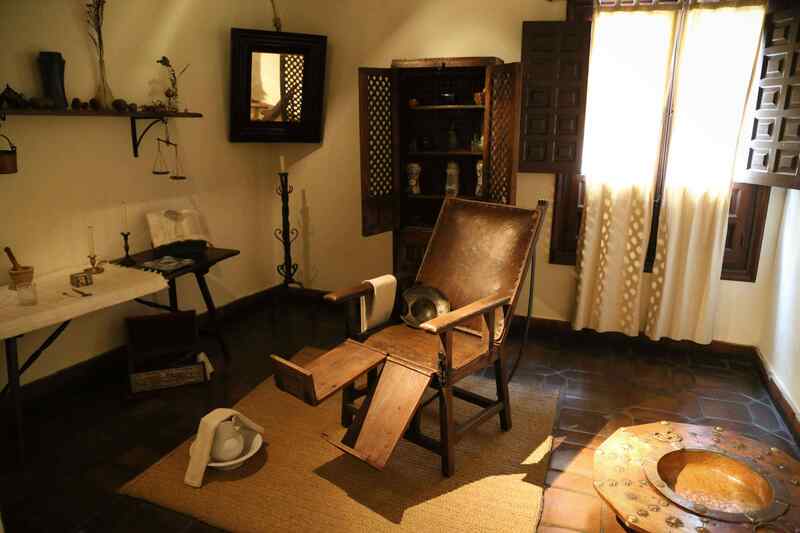 This piece in the center of the room served for what might have been a barber’s chair back in Cervantes’ day. 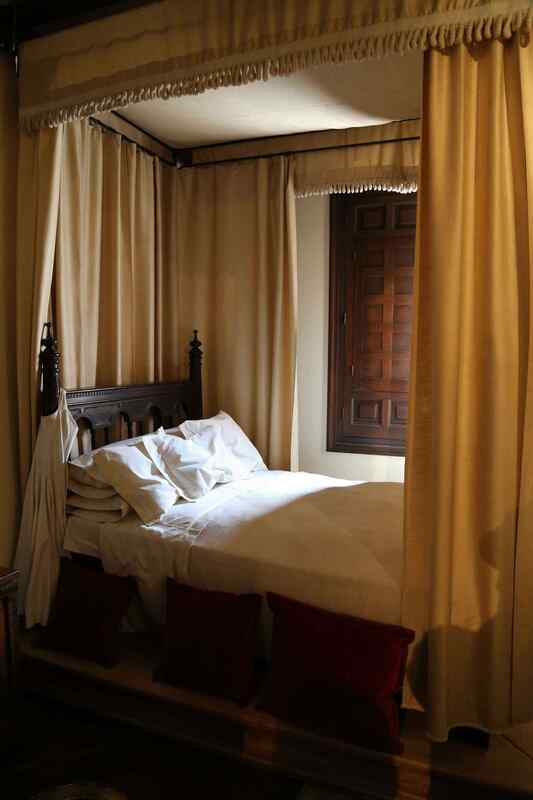 Cervantes died in April 1616 in Madrid, having never returned to Alcala de Henares. Nevertheless, the city celebrates him as their most famous son, where the family home is preserved and statutes to honor him are found in the city. 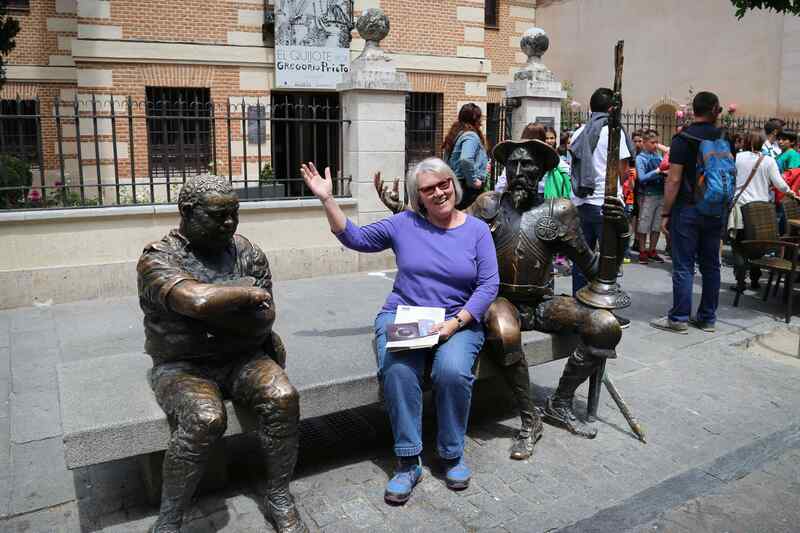 A world traveler waves to the crowd, just as Cervantes does, while faithful companion Sancho Panza keeps his distance. At the time of his birth, absolutely no one would have or could have predicted that Miguel Cervantes would become one of the greatest writers of all time. But through determination and a willingness to embark upon his own quixotic adventure and tilt at the windmills in front of him, Cervantes demonstrated how well he drew from the wellspring of knowledge.